If you plan on mailing checks to your Vendors, you may consider purchasing double window check envelopes for easy check mailing. Some banks require MICR ink be used when printing checks. As this is not a universal requirement in the digital banking age, it is recommended that you contact your bank to inquire if MICR ink is required. Depending on your Organizational Philosophy, you have the option to Print Checks from your Legal Entity (the Legal Entity that owns the Location that is Paying the Check), or you can Print Checks from the Location itself. This is a Global setting and is not specific to Legal Entities or Locations. It can be set on the System Preferences: Miscellaneous Tab. The Default selection is 'Legal Entity'. In Restaurant365, Bank Accounts reside in the General Ledger as GL Accounts. To classify a GL Account as a Bank Accounts, check the 'Is Bank Account' checkbox on the GL Account Record. Click here for more information on GL Account Records. To create a new Bank Account, please see the Add a New Bank Account training. To create a new Bank (#3 in the image below), please see the Add a New Bank training. 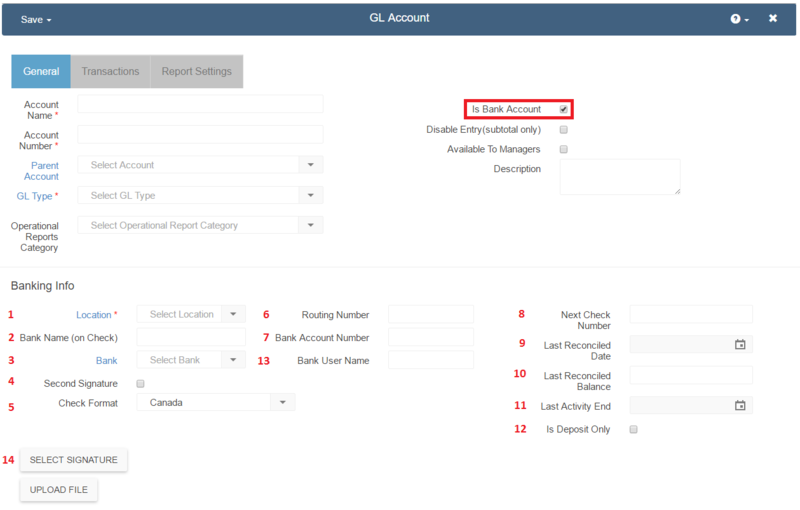 When a GL Account is identified as a Bank Account, the GL Account will appear in the Bank Accounts List view (located under Banking in the Accounting Module), additionally the GL Account will be made available on the Bank Activity and Bank Reconciliation screens. Click here for more information on Bank Activity, and Bank Reconciliation. The checkbox highlighted in red below is to specify if the GL Account is a Bank Account (an Account that will be made available in the Bank Accounts List View, as well as the Bank Activity / Reconciliation screens). To complete the check printing setup, you need to have your Bank Information properly set up in Restaurant365. Navigate to Accounting>> Bank Accounts >> and find and open the Bank Account from which you will be printing checks. The Bank Account Record will open with the fields shown in the following image. To properly print checks, the Location (1), Bank Name (on Check)(2), Bank (3), Routing Number (6), Bank Account Number (7), and Next Check Number (8) must be completed, and the record saved. Please see the legend below for a description of each field on the Bank Account Record. 3) Bank - This field will identify the Banking Institution and the type of Bank Account. Click on the selector to choose the appropriate Bank. If the institution isn't listed, click on the 'Bank' text to the left of the field, and a new tab will open where you can create the Banking Institution.